On Tuesday, August 25th, 2015, Healthy Start launched the Fetal & Infant Mortality Review Board to ensure that more Ingham County babies are making it to their first birthday. Fetal and Infant Mortality Review (FIMR) is an action-oriented community process that continually assesses, monitors, and works to improve service systems and community resources for women, infants, and families. Research shows FIMR is an effective perinatal systems intervention. Over 75 community stakeholders attended the luncheon and made a commitment to take an active role in this process. Attendees included community members, law enforcement, elected officials, senior hospital administrators, nurses, health department officials, and non-profit leaders, among others. We want to give a special thanks to all of those who attended the luncheon and to those who helped make this event possible. Over the next 3-4 months, FIMR staff will review and analyze information collected in interviews and medical data abstractions related to recent fetal and infant deaths in Ingham County. FIMR staff will generate summary reports to bring forth to the Case Review Team. Our first Case Review Team will convene in late-January 2016. The date will be based on everyone's availability as outlined in the surveys and the meeting information will be sent the first week of January 2016. If you have not had an opportunity to sign-up for either the Case Review Team or Community Action Team or if you have any questions, please feel free to contact Alysia Osoff, FIMR Coordinator. The NFIMR office is facilitating the database and best practices workgroup. They have heard from many of you and will be sending more information shortly. Esther Shaw from MPHI and Jodi are leading the database workgroup. Please contact jshaefer@acog.org if you are interested in participating in these workgroups. The FIMR CDR models of collaboration workgroup is being coordinated by Abby Collier. Abby is with the Children's Health Alliance of Wisconsin. Over the last four years, she has worked to develop models for collaboration and piloted them in several Wisconsin counties. During this process we learned there are many opportunities to collaborate between CDR and FIMR while maintaining the integrity of each review system. If you are interested in joining this workgroup, participating in individualized technical assistance or have any questions, please contact Abby Collier at (414) 337-4566 or ajcollier@chw.org. Thank you in advance for your support of our work to decrease infant mortality and improve the health of our community. Read More. A means to implement needs assessment, quality assurance and policy development which are essential public health functions, at the local level. 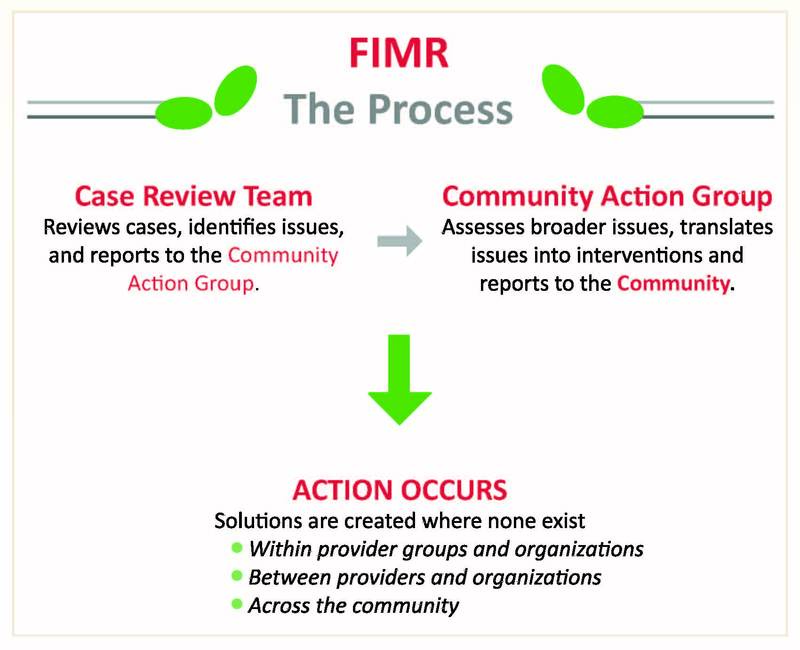 Composed of health, social service and other experts; the FIMR case review team (CRT) examines the case summary, identifies issues, and makes recommendations for community change if appropriate. The FIMR process is not about assigning blame, it is an examination of circumstances surrounding the death to identify system gaps. The FIMR process is similar to a root cause analysis. Because cases are selected based on the community disparities for infant mortality, it is not a surveillance system either. The first step is for the Case Review Team to review all the case data and make recommendations. The next step is for the Community Action Team to take the recommendations, prioritize them, and make the changes needed in the community's service delivery system. Summarizes findings and create recommendations to improve the community's service delivery systems and community resources. Safeguard successful FIMR systems changes from being discontinued in the future. One of the most positive and effective projects to come directly out of VPC FIMR is the Baby Basics Moms Club (BBMC). BBMC is a waiting room based education tool that targets, but is not limited to, low literacy, low income pregnant women. There are 24 topics covered which include 6 core topics of Safe Sleep, Substance Abuse/Tobacco Use, Nutrition, Preterm Labor, Breastfeeding, Postpartum Depression/Domestic Violence, These core topics have been identified in FIMR and are considered priorities by the CAT for consumer education. Moms club has grown from 1 site in 2010 to 5 sites in 2012. Club meetings last approximately 90 minutes and generally two topics are covered in each meeting. On average 6 to 12 moms attend each club meeting per week and bring a support partner with them. These are typically women who would not attend a traditional childbirth education class. Incentives are built into the club for certain milestones met (this is all funded through outside support). There is a one on one program/participant evaluation tool offered at 6 weeks post-partum to assess for changes in behavior, program satisfaction and linkage to other services that address the needs of the moms to be and her family. Read More. This Manual is also written with the understanding that many of the decisions that go into developing projects like FIMR are local in nature. There are many aspects to FIMR for which there are no right or wrong approaches, only the way that works best in a particular situation. On the other hand, in the experience of FIMR programs and the evidence from the national evaluation of FIMR, certain components of FIMR are better done one way than any other. This book points out the things that have worked best in most programs. Read More.